Kakadu’s rock art is world class and a major reason why the area is World Heritage listed. 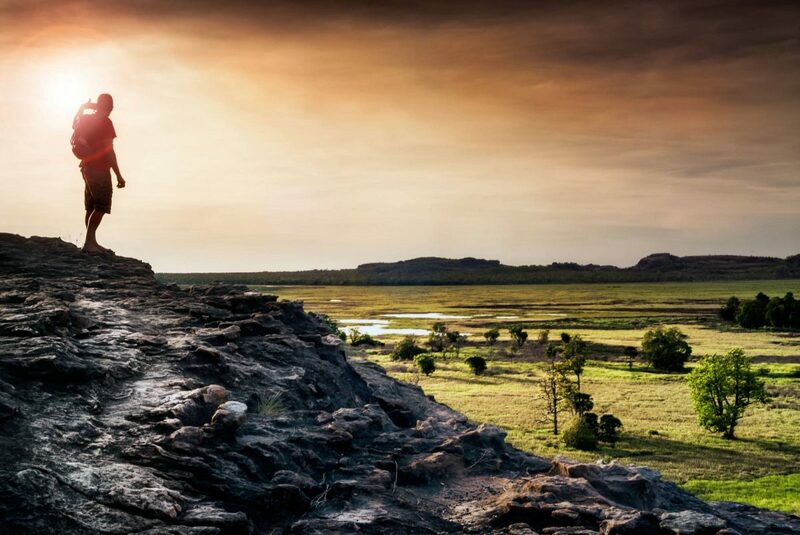 Ubirr (pronounced oo-bir, with a short ‘oo’) is home to some of Kakadu’s most famous rock art and is an area steeped in Aboriginal culture and tradition. Kakadu’s rock art is world class and a major reason why the area is World Heritage listed. Ubirr (pronounced oo-bir, with a short ‘oo’) is home to some of the most famous rock art in Kakadu and is an area steeped in Aboriginal culture and tradition. What makes Ubirr particularly awe inspiring is the view from the Look Out which will take your breath away. Ubirr is located approximately 40 km’s from the township of Jabiru and will no doubt leave a lasting impression etched in your memory for years to come. On entering the site there is a large car park with a number of picnic tables. Clear signage will lead you to a 1 kilometre circuit walk to view the Rock Art which depicts traditional aboriginal foods and tells stories about law and creation, with paintings up to 20 000 years old! The circuit walk is classified as easy having disabled access, you should allow at least 45 minutes to complete. There is an additional walk up to the Look Out where you will be greeted with 360 degree views of the floodplains and rocky escarpment of Kakadu. It is highly recommended you prioritise your time to be at the Look Out just prior to sunset. The walk up to the Look Out is relatively short (approximately 250 metres) however is moderately challenging including uneven rocky surfaces along a marked track. It is recommended you allow 30 minutes to make your way up and enjoy the Look Out. Located approximately 2 km before entry to Ubirr Rock Art Site, on your left, is The Border Store. You can’t miss it! The Border Store is a charming, simplistic bush cafe which also operates as a Thai Restaurant, including take away meals. The locals of Jabiru rave about the food which is simply delicious and it is a convenient stop over on your way home from Ubirr if you haven’t organised your dinner plans yet! If you decide not to dine in it is recommended you order on your way to Ubirr and pick up on the way back, due to its popularity during the Dry Season. The Guluyambi Cultural Cruise operates on the East Alligator River from May-Nov. SEE HERE for more information and bookings. The infamous Cahill’s Crossing is also located in this area. It is approximately a 300 m walk from The Border Store or if you are travelling by car there is clear signage at the turn off just prior to The Border Store which will take you to the Cahill’s Crossing car park. From here you will take a short easy walk across a small foot bridge to the East Alligator River which runs between Kakadu and Arnhem Land. From the viewing platform you can admire the beauty of the river and if you are lucky you may spot a crocodile in its natural environment! Cahill’s Crossing is well known for the high numbers of crocodiles which converge on the crossing at the change of the tide in an attempt to catch Barramundi moving from one side of the crossing to the other, it is a sight to be seen! Distance: The turnoff to Ubirr Rock Art Site is approximately 1 kilometre North from Jabiru Township along the Arnhem Highway. From the turnoff it is another 39 km’s West on sealed road. Opening Times: Daily, May to November from 8.30 am to sunset. From December to April 2 pm to sunset. Facilities: Ubirr Rock Art Site Day Use Area includes car park and picnic tables. Toilet Block located at The Border Store (long drop). Alcohol prohibited. Camping near by: Merl campground. Facilities include showers, toilets and a generator zone. Camping fees are collected on site. Camping fees CASH ONLY: $15 per adult, $7.50 per child (5-15 years), $38.00 per family (2 adults and 2+ children). Contact Bowali Visitor Centre for more information. The Border Store: Open June to October, 8:30 am to 8:00 pm. Confirm times by contacting directly on 08 8979 2474.